THIS GALLERY DATES FROM 2007: THE IMAGE CHOICE & TEXT WERE REVISED IN 2015 AND 2016 I've had a long interest in abstract painting and a somewhat intermittent practical involvement. 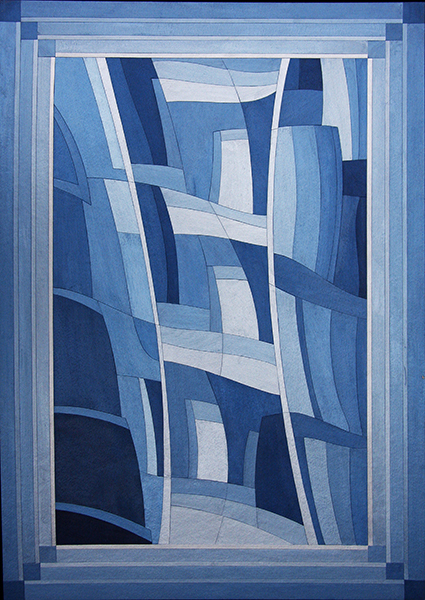 This acrylic from 2003 is one of the last in a series based on film photographs of Chicago architecture. Each started as a spontaneous line drawing on watercolour paper without preparatory sketches: colours were selected from systematic mixing research. "Chicago architecture" and "abstract" became "Chicago Archistract" plus a sequential suffix number as a title theme. There are three other ABSTRACTION galleries using a range of starting points including architecture. 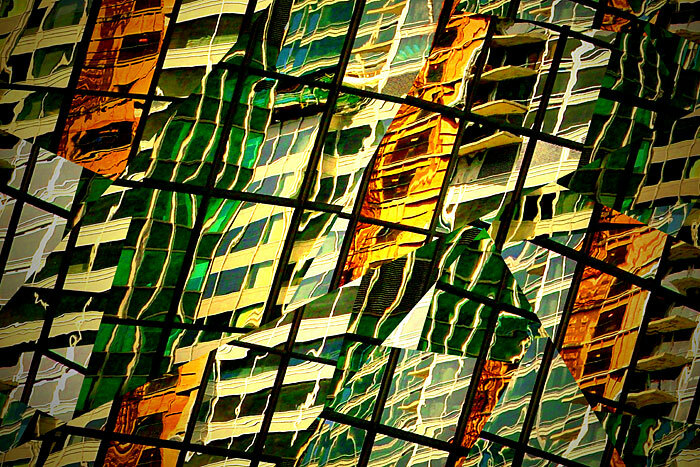 (END) IMAGE: Reflections of several buildings in a single façade were deconstructed in this colour enhanced image. A shaft of afternoon sunlight channelled by clouds and high buildings brightened the central area. 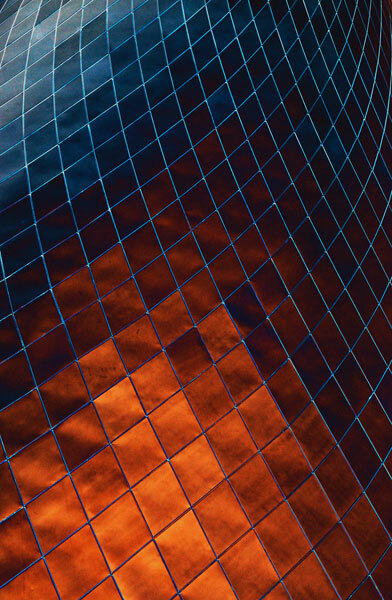 The dark and fragmented glazing bar grid of the host building stands in contrast. The colours are more saturated renditions of those recorded directly by the camera. 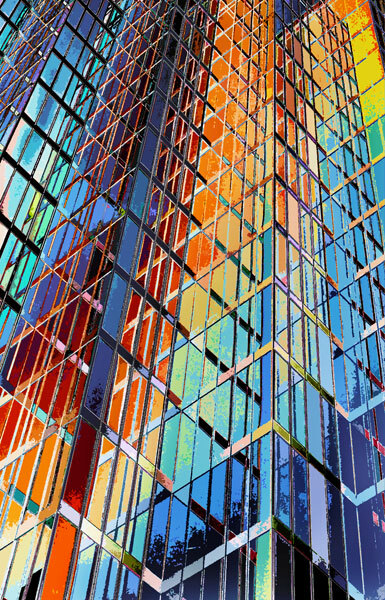 Architectural fenestration can be a rich source of inspiration. 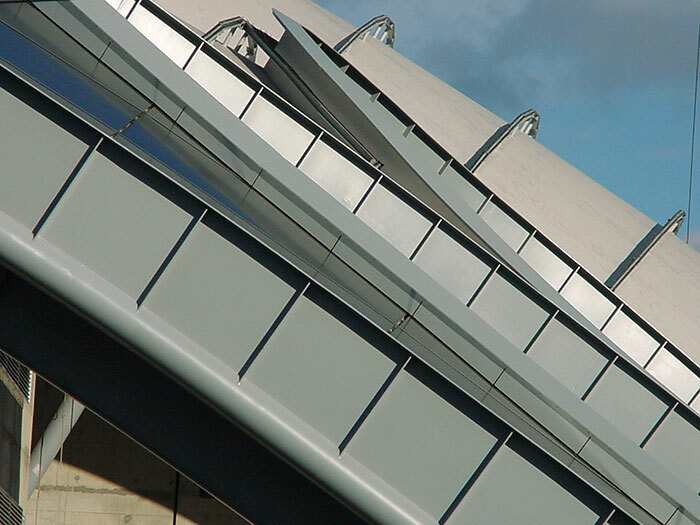 This is one of several images progressed from photographs of the Dynamic Earth building, Edinburgh, designed by Michael Hopkins and completed in 1999. Under its tensioned fabric roof, the long glazed front elevation reflects the nearby Scottish Parliament Building, and others, in this stylized composition. To those reflections the original photograph added details of the interior structure and artefacts. The warm yellow tones were picked up from reality to be enhanced and contrasted with dark detailing and the deep green of an enclosed tree. This composition is derived from the same set of photographs used in Image 08 to which it stands in considerable contrast. I had thought to work paintings in parallel with digital prints but the time consuming technique I used in the former would become even more demanding under the more complex print influence. At the time it would have enabled large compositions but the developments in digital print technology potentially removed that advantage. 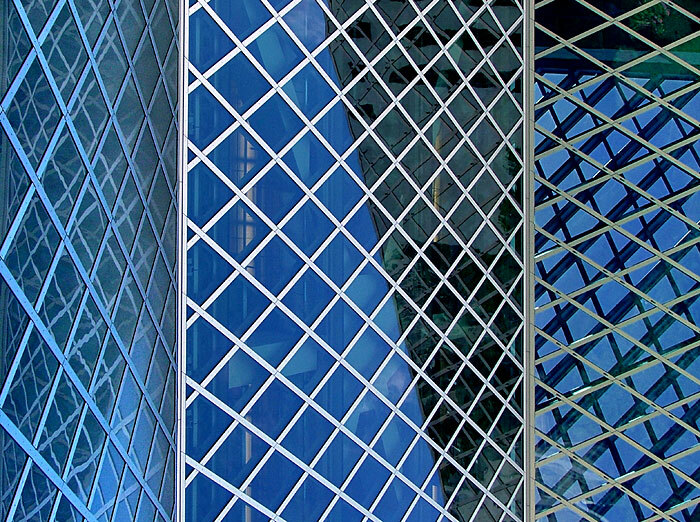 The Seattle Central library building designed by Rem Koolhaus & OMA was completed in 2004. nIts unique form is not to everyone's taste but I found it a fascinating building to view, both inside and out. As a reader, its book collections and generous computer provision were rewarding. Sometimes natural light penetrates the glazing grid deep into the interior to reveal structural steelwork. 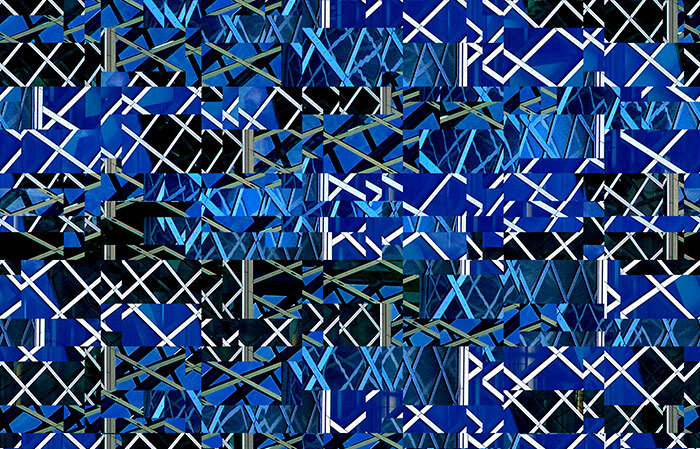 Here, a slight rearrangement of parts and a translation to a range of sharper blues underpin this altered image. This triptych is assembled from separate original photographs with enhancement of their original reflected blue sky colour base. I thought at the time that the building offered considerable scope for inventive abstraction and these are selected from those first explorations. I've recently worked intermittently on architectural themes alongside new computer techniques and later in the year intend to select images for a new gallery. 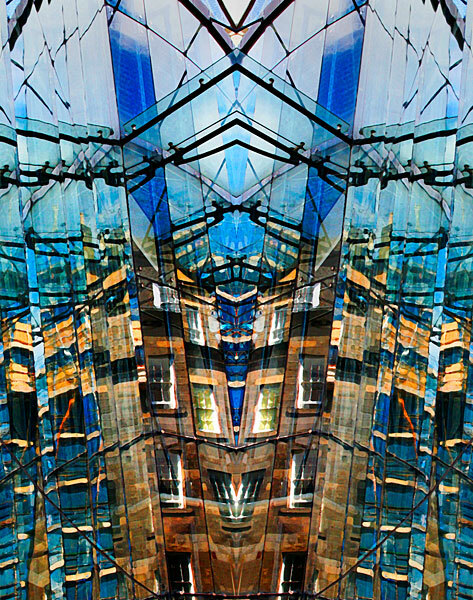 In this design I set the camera to use the junction between two sections of geometric glazing tracery to create a strong diagonal line between the two triangles. 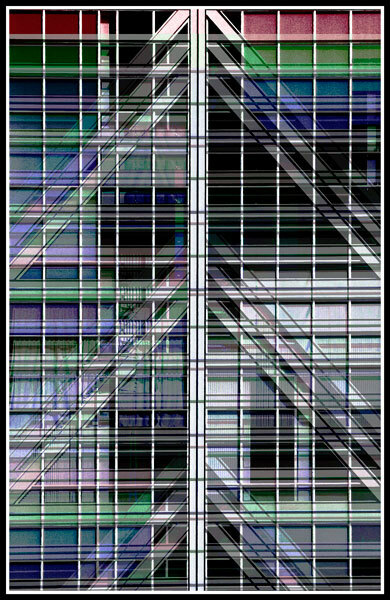 The upper one reveals the interior structure of the building whilst the lower frames a somewhat ambiguous pairing of one glazing grid and reflections of another. I was interested in the contrasts of symmetry with asymmetry and the enhancement of interior light sources to introduce flashes of hotter colour. 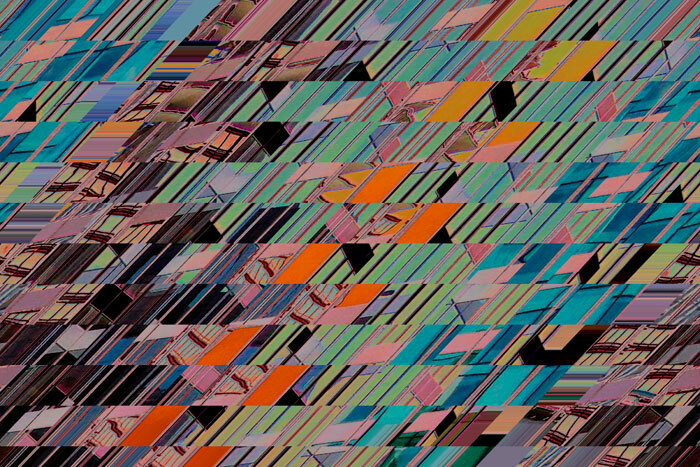 Computer manipulation conjures colour abstractions that I could not conceive and execute directly in paint; it seemed rather pointless to rework an image such as this as a painting. The final paintings I worked involved a time consuming technique that gave great control over the hard edge quality of the shapes within the compositions and made it routinely simple to apply the almost flat colour sought. It was much easier to work than painting up to pencil lines drawn on canvas or board. 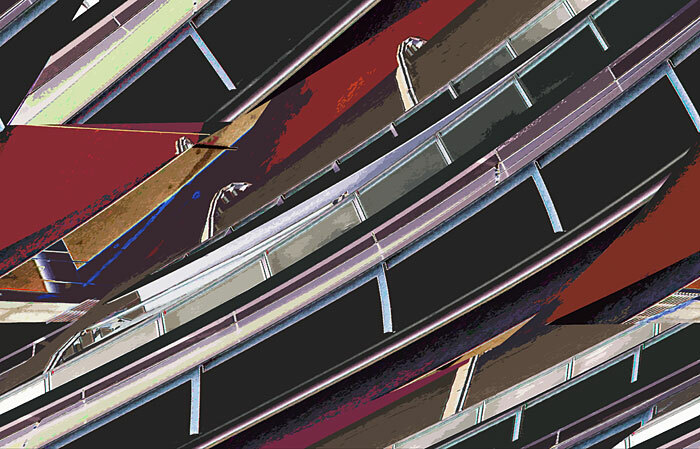 This image is derived from a detail shot of the lower section of an interior escalator: it's the most extreme development of the archistract theme in this early image set. 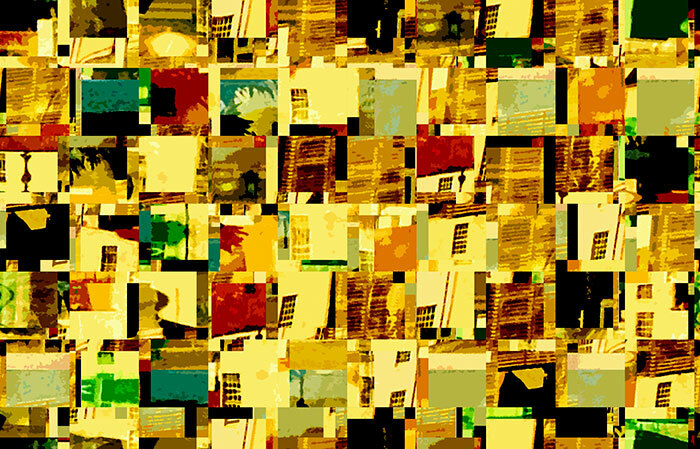 In reality the panelling of austere spaces housing the cascade of moving steps and intermediate landings featured a distinctively sharp yellow. From that starting point I could not have created this composition by imagination and paint: it's the nearest to a truly non-representational image in the whole set. A curving façade of flat glass panels was added to the original 1928 auditorium structure as part of the 1994 renovation and extension of the Festival Theatre designed by the architects Law & Dunbar-Naismith. 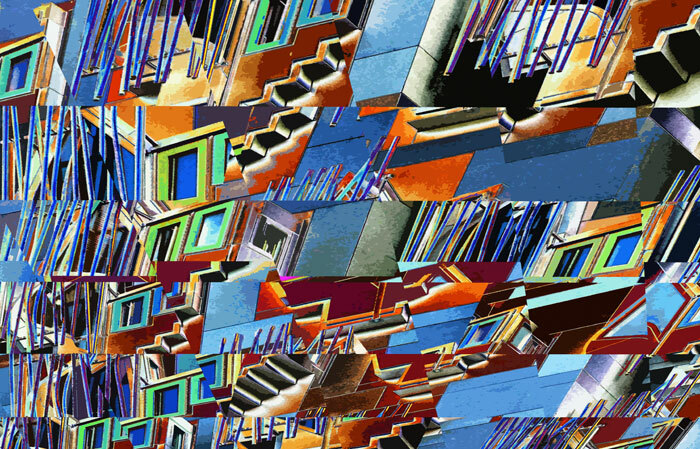 This abstraction is based on one of the photographs of multiple streetscape reflections on the building contained in the REFLECTIONS IN ARCHITECTURE gallery. 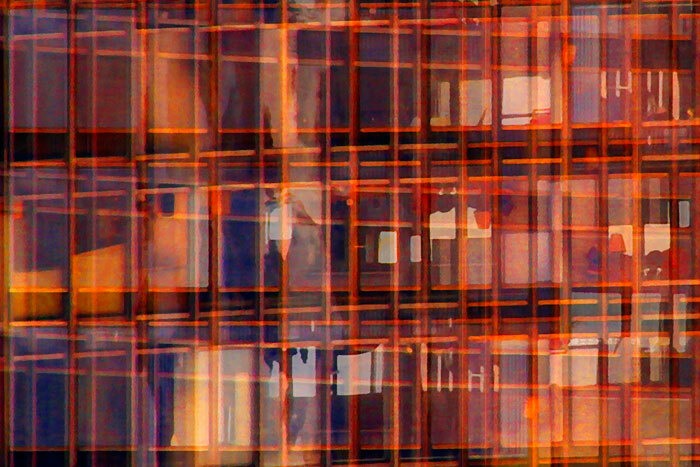 Variations in camera placing created a wide range of fragmented reflections even before computer manipulation. The original photograph of the Erie on the Park tower was made from the boat on a Chicago Architecture Foundation river cruise. Working with three offset layers and subtle colour enhancements created this final image. A formal river cruise with expert commentary is an interesting experience but it wasn't easy to simultaneously listen, look at buildings, use the viewfinder and operate the camera. Taking a small river ferry was as practical and less expensive. It was a good way to move through massed architecture whilst seated and using a succession of landing stages from which to explore on foot. The Museum of Glass in Tacoma, Washington State, houses working studios and exhibition galleries. The two entry Bridges of Glass carry Dale Chihuly's Seaform Pavilion and Venetian Wall with two tall Crystal Towers standing between. His virtuoso glass can be seen in public and private collections worldwide but particularly here on his home territory in America's Pacific Northwest. 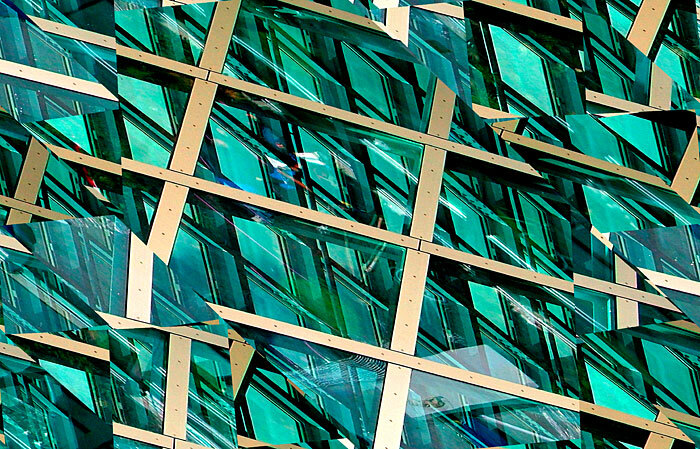 This diamond abstraction is taken from the external steel cladding on the tall conical structure containing hot glass studio workshops. 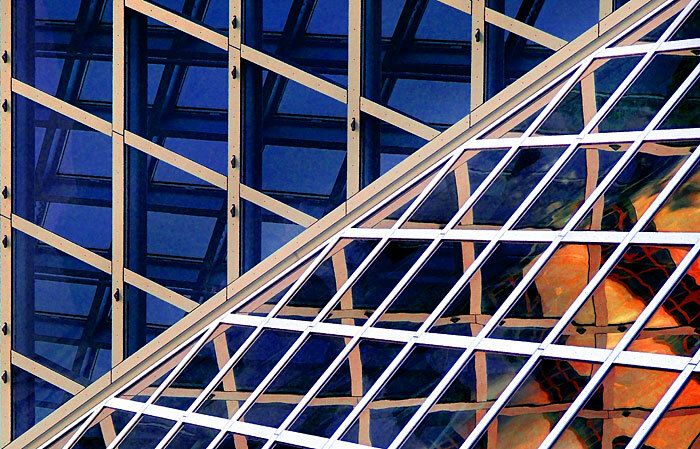 Look at the TACOMA ARCHITECTURE GALLERY for photographs of the museum and other buildings. A photograph of Commerce Place, a tall commercial building in Vancouver, underpins this image. 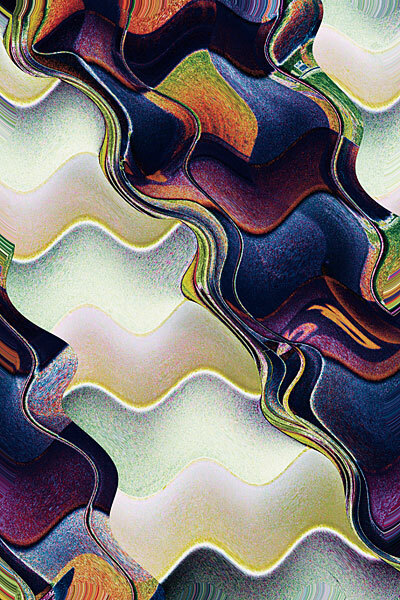 It was achieved through creative computer exploration seeking an intuitive colour resolution that felt emotionally appropriate. The blue sky lent a light but sharp blue tint to the glass contained within the polished metal frames. A 100 X 70cm framed enlargement of it emphasises earlier comments about the impossibility of conceiving such compositions as paintings. At home it hangs alongside the acrylic painting "Chicago Archistract 29", its direct ancestor, shown as Image 01.